Download "2006 RESEARCH GRANT FINAL PROJECT REPORT"
1 2006 RESEARCH GRANT FINAL PROJECT REPORT Date: June 26, 2009 AIR Award Number: RG Principal Investigator Name: Patricia Cerrito Principal Investigator Institution: University of Louisville Secondary Principal Investigator Name(s): Secondary Principal Investigator Institution(s): Award Amount: 29,629 Proposal Title: Methods to Examine the Gatekeepers to Graduation 1. List of current and pending publications based on the project s findings Book, entitled, Investigations of University Expectations Using Text Documents and the Enrollment Database, Cerrito PB. Pending with Bentham Science, Inc. Cerrito PB. Using SAS Enterprise Miner to Examine General Education Issues. SESUG Proceedings. October, Cerrito PB. 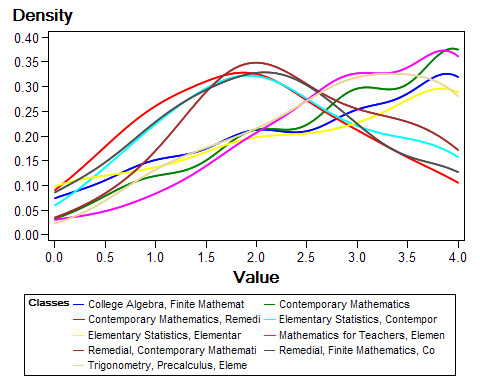 Data Mining Student Performance in Mathematics Courses. CINSUG Proceedings. November, Presentations Cerrito PB. Mathematics as the Gatekeeper to Success, AIR 2006 Forum, Chicago. May, Cerrito, PB. Invited Address. 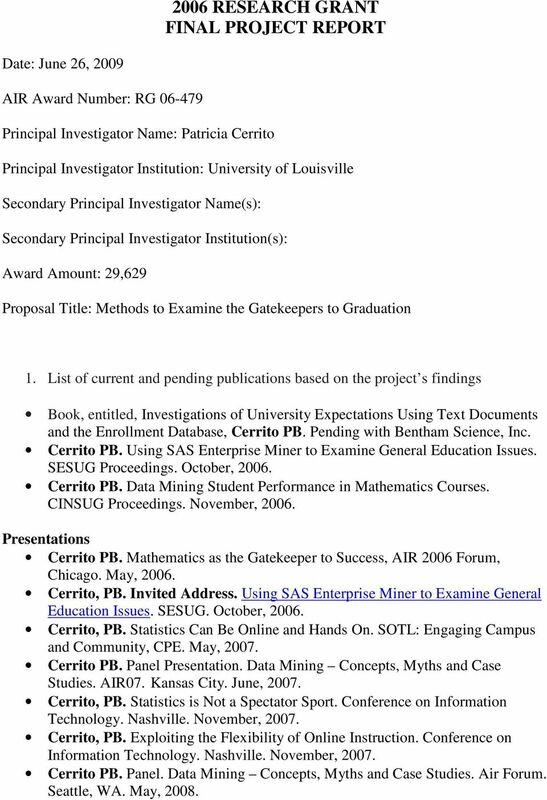 Using SAS Enterprise Miner to Examine General Education Issues. SESUG. October, Cerrito, PB. Statistics Can Be Online and Hands On. SOTL: Engaging Campus and Community, CPE. May, Cerrito PB. Panel Presentation. Data Mining Concepts, Myths and Case Studies. AIR07. Kansas City. June, Cerrito, PB. Statistics is Not a Spectator Sport. Conference on Information Technology. Nashville. November, Cerrito, PB. Exploiting the Flexibility of Online Instruction. Conference on Information Technology. Nashville. November, Cerrito PB. Panel. Data Mining Concepts, Myths and Case Studies. Air Forum. Seattle, WA. May, 2008. 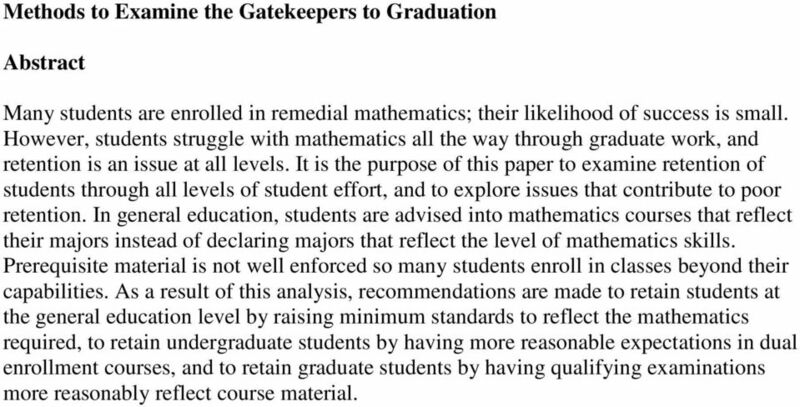 4 Methods to Examine the Gatekeepers to Graduation Abstract Many students are enrolled in remedial mathematics; their likelihood of success is small. However, students struggle with mathematics all the way through graduate work, and retention is an issue at all levels. It is the purpose of this paper to examine retention of students through all levels of student effort, and to explore issues that contribute to poor retention. 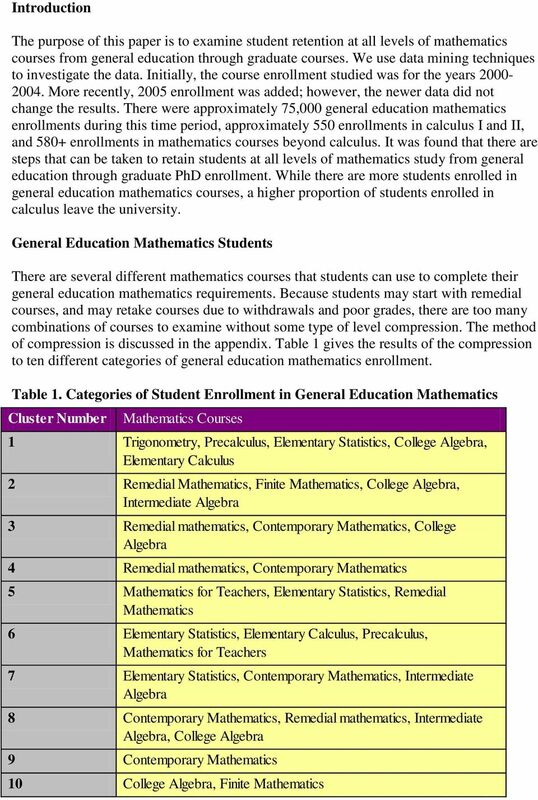 In general education, students are advised into mathematics courses that reflect their majors instead of declaring majors that reflect the level of mathematics skills. Prerequisite material is not well enforced so many students enroll in classes beyond their capabilities. 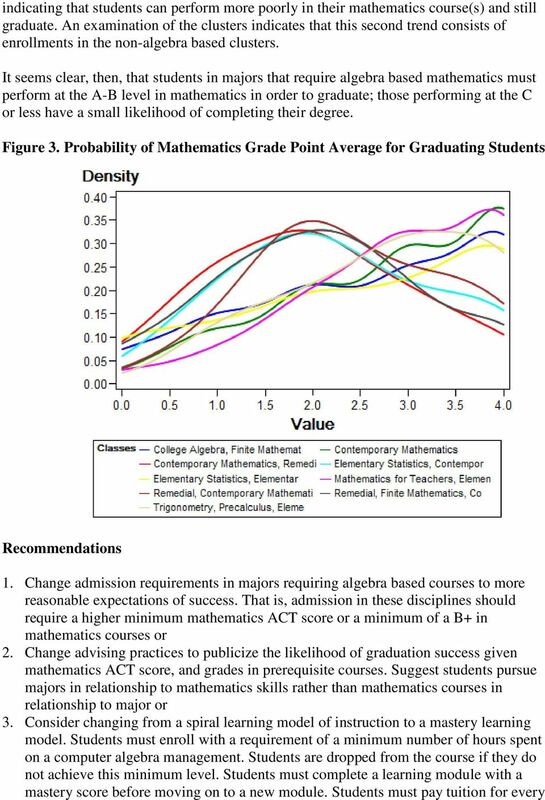 As a result of this analysis, recommendations are made to retain students at the general education level by raising minimum standards to reflect the mathematics required, to retain undergraduate students by having more reasonable expectations in dual enrollment courses, and to retain graduate students by having qualifying examinations more reasonably reflect course material. 8 semester enrolled, but are given a deferred grade until completion of all learning modules. Calculus Students Students should not enroll in Calculus classes without having the necessary background material in algebra. Table 2 shows the enrollment in Calculus by Math ACT score or by previous completion of prerequisite courses. 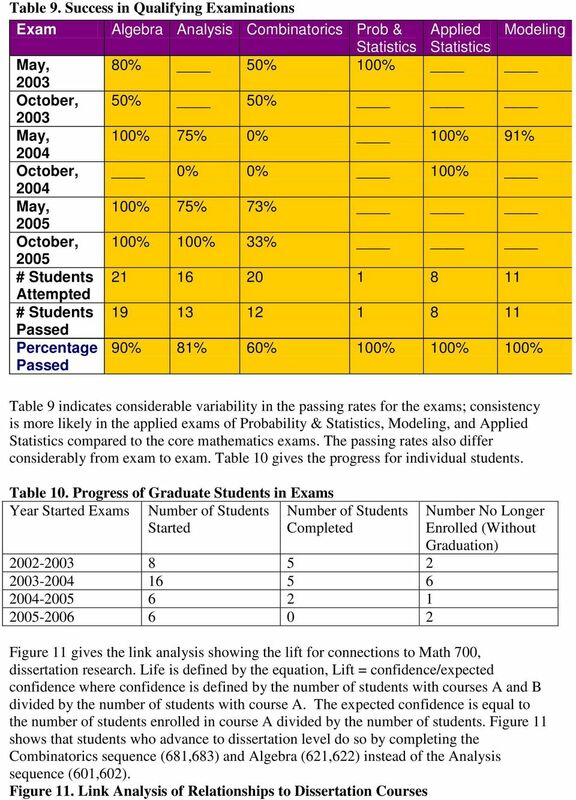 The table indicates that many students do enroll in Calculus without the required algebra skills. Figure 4 shows that most of these students will fail in Calculus. Table 2. Calculus Enrollment by ACT Score ACT Level Enroll in Calculus Without Prerequisites Enroll in Calculus With Algebra Enroll in Calculus with Precalculus Low performance in Calculus occurs when students have low math ACT scores independent of whether they have completed the required prerequisite courses to gain background in algebra. The success rate only climbs above 50% when students have at least a minimum Math ACT of The success rate increases to 70% when students have a minimum Math ACT of The minimum required for enrollment is 27. Science and Mathematics majors are generally required to take at least one semester of Calculus. Many students in Engineering also enroll in Calculus, although Engineering also offers its own Calculus sequence. 9 Figure 4. 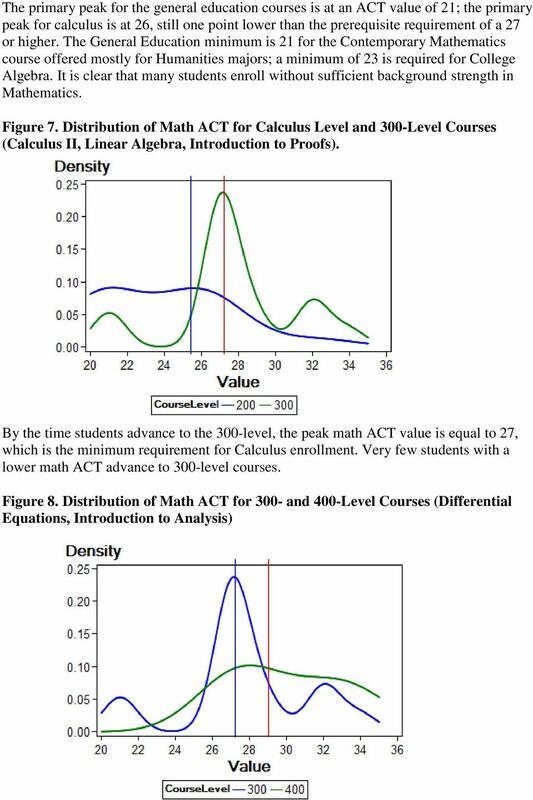 Success in Calculus (Grade A,B,C) by ACT Score = However, students will not be successful in calculus unless they have the necessary algebra background. Unfortunately, many students enroll in calculus lacking these skills. Table 3 gives the proportion of students who leave the University by their level of mathematics instruction. The table indicates that a higher proportion of students in Calculus will leave compared to students enrolled in General Education. Students who declare a mathematics major while enrolled in General Education are very likely to change their majors, or to leave. This result reinforces the recommendation that a mathematics major should have a higher minimum math ACT. Table 3. 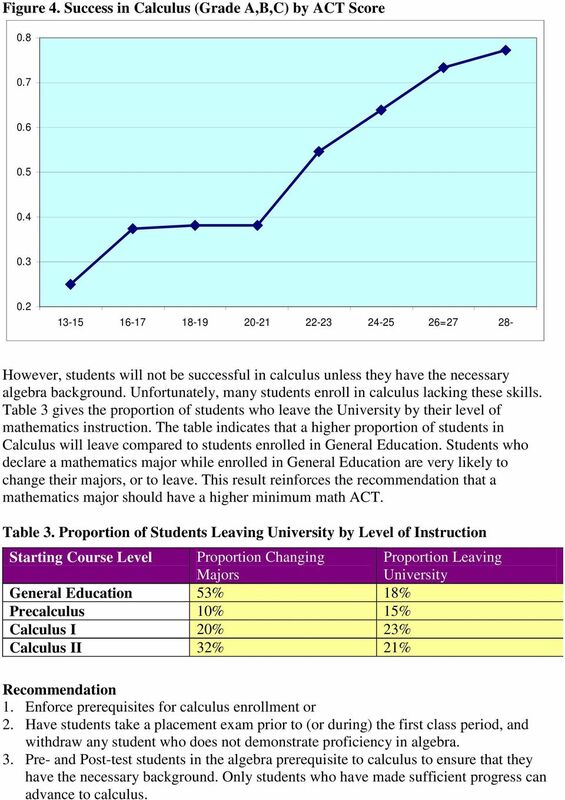 Proportion of Students Leaving University by Level of Instruction Starting Course Level Proportion Changing Majors Proportion Leaving University General Education 53% 18% Precalculus 10% 15% Calculus I 20% 23% Calculus II 32% 21% Recommendation 1. Enforce prerequisites for calculus enrollment or 2. Have students take a placement exam prior to (or during) the first class period, and withdraw any student who does not demonstrate proficiency in algebra. 3. Pre- and Post-test students in the algebra prerequisite to calculus to ensure that they have the necessary background. Only students who have made sufficient progress can advance to calculus. 11 1. Why is there a difference in success rates between BA and BS students? 2. What is the impact of this grade differential on student retention? 3. Do other departments also have disparate grading between graduate and undergraduate students that can impact outcomes and retention? In order to examine the difference between BA and BS students, we must first identify the course requirements that differentiate the two degrees. The courses required for the undergraduate options are BA: Algebra I, Analysis I, 2 electives BS: 4 possible options that all include Algebra I, Analysis I, 2 electives o Probability, Statistics, Probability Models o Modeling I,II o Data analysis, Probability, Statistics, Probability Models or Sampling o Analysis II, Algebra II, Probability Students enrolled in the BA option take only two dual-enrollment courses while students in the BS must take a minimum of four such courses. Moreover, students in the MA program are considered deficient if they have not completed Analysis I,II and Algebra I,II. 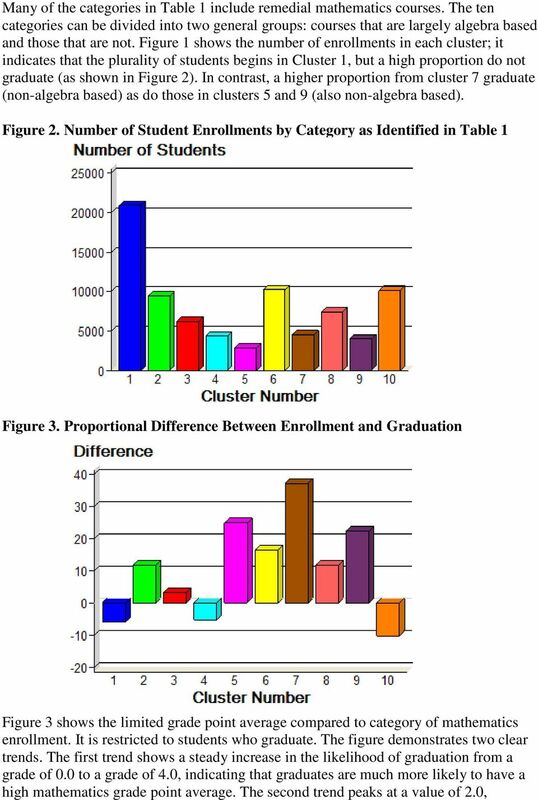 Therefore, Analysis I and Algebra I have primarily undergraduate enrollment while the other courses have considerably higher rates of graduate enrollment. 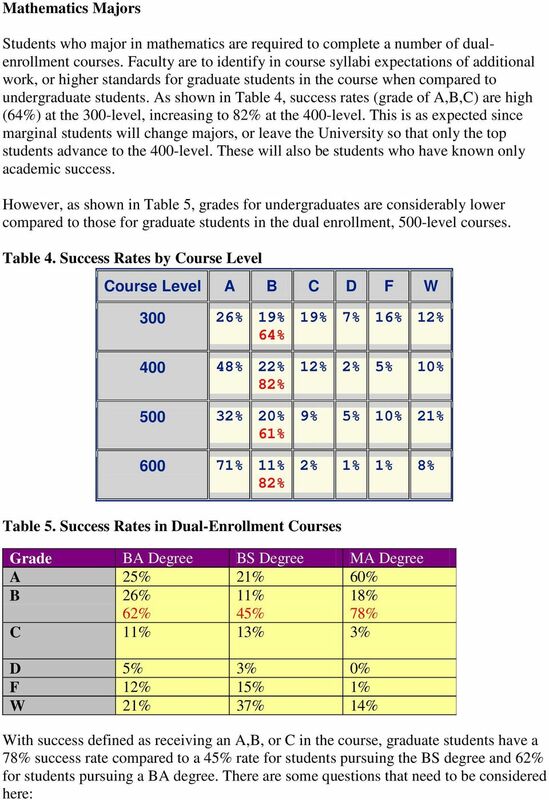 Table 6 examines the graduate rate compared to the grades received. At the 500-level, 80% of undergraduates who receive an A, and 76% of those who receive a B graduate. However, only 27% of those who receive a D or F, and 20% of those who drop the course graduate with a degree. Therefore, the practice of dual-enrollment penalizes undergraduate students and reduces the retention rate and the graduate rate. Since 55% of BS students do not succeed at the 500-level, and fewer than 25% graduate, retention is low for students in their senior year of mathematics instruction. Table 6. Graduation by Grade in Course Level Graduation Rate B grades C grades D,F grades W grades Course Level for A grades % 30% 18% 0% 50% % 0% 0% 41% 0% % 49% 37% 20% 46% % 0% 0% 0% 0% % 76% 100% 27% 20% % 100% 100% 0% 0% Three non-mathematics departments were considered by course level (Figure 5). The dip in success rates at the dual-enrollment (500) level are apparent. This trend appears to be quite common across departments, and should be a concern across the University, not just in mathematics. 12 Figure 5. 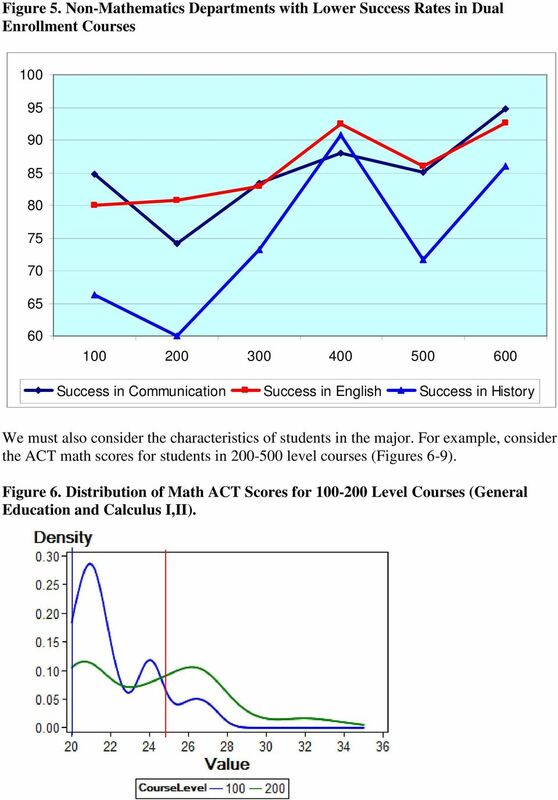 Non-Mathematics Departments with Lower Success Rates in Dual Enrollment Courses Success in Communication Success in English Success in History We must also consider the characteristics of students in the major. 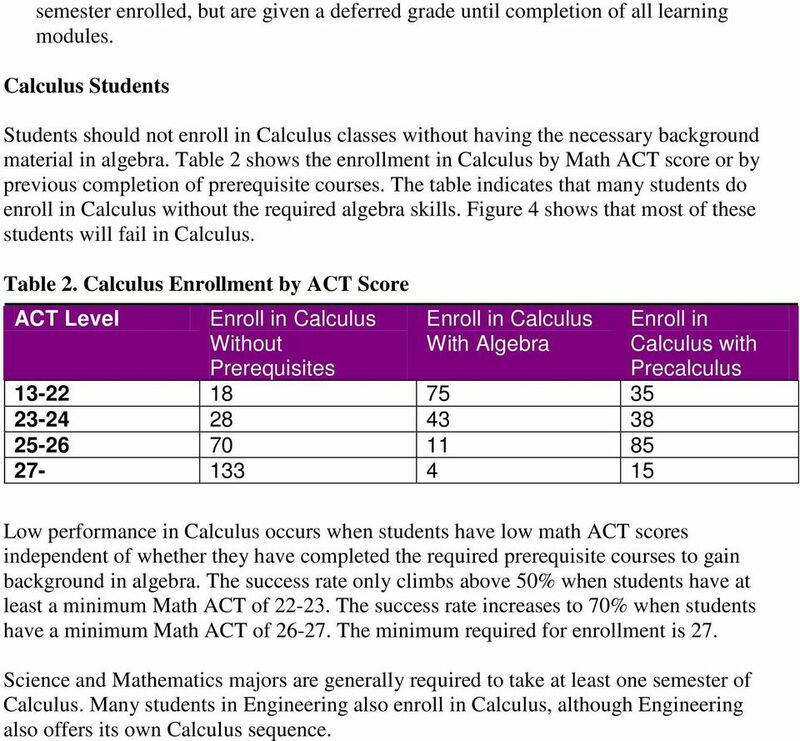 For example, consider the ACT math scores for students in level courses (Figures 6-9). Figure 6. Distribution of Math ACT Scores for Level Courses (General Education and Calculus I,II). 14 By the 400-level, approximately half of the students have a math ACT of 29 or better, indicating that students with the minimum of start to struggle. Figure 9. 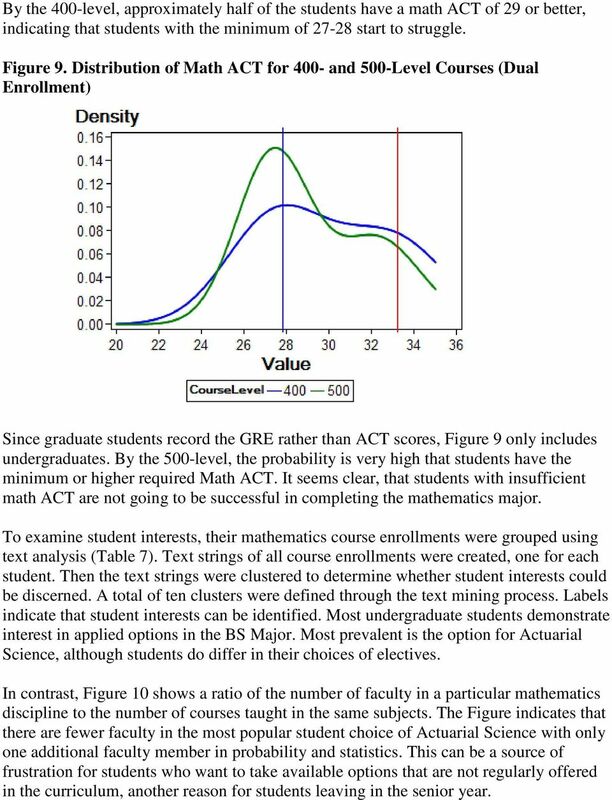 Distribution of Math ACT for 400- and 500-Level Courses (Dual Enrollment) Since graduate students record the GRE rather than ACT scores, Figure 9 only includes undergraduates. 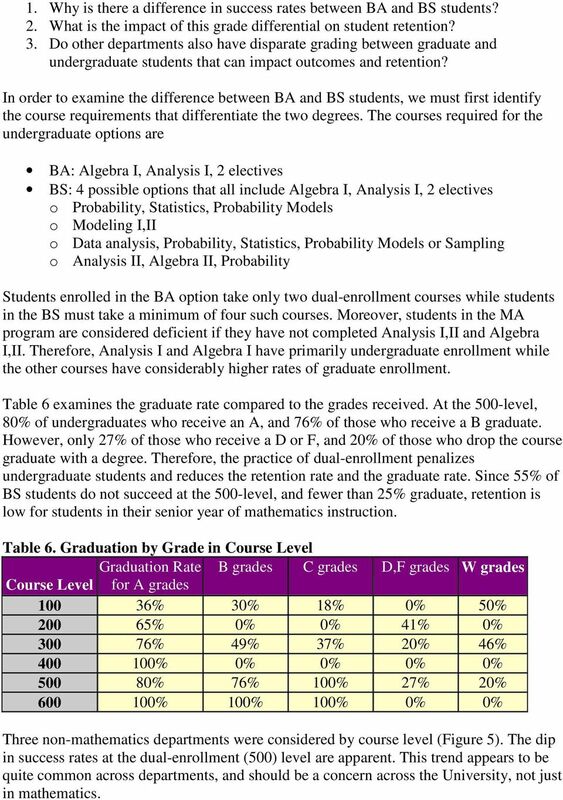 By the 500-level, the probability is very high that students have the minimum or higher required Math ACT. It seems clear, that students with insufficient math ACT are not going to be successful in completing the mathematics major. To examine student interests, their mathematics course enrollments were grouped using text analysis (Table 7). Text strings of all course enrollments were created, one for each student. Then the text strings were clustered to determine whether student interests could be discerned. A total of ten clusters were defined through the text mining process. Labels indicate that student interests can be identified. Most undergraduate students demonstrate interest in applied options in the BS Major. Most prevalent is the option for Actuarial Science, although students do differ in their choices of electives. 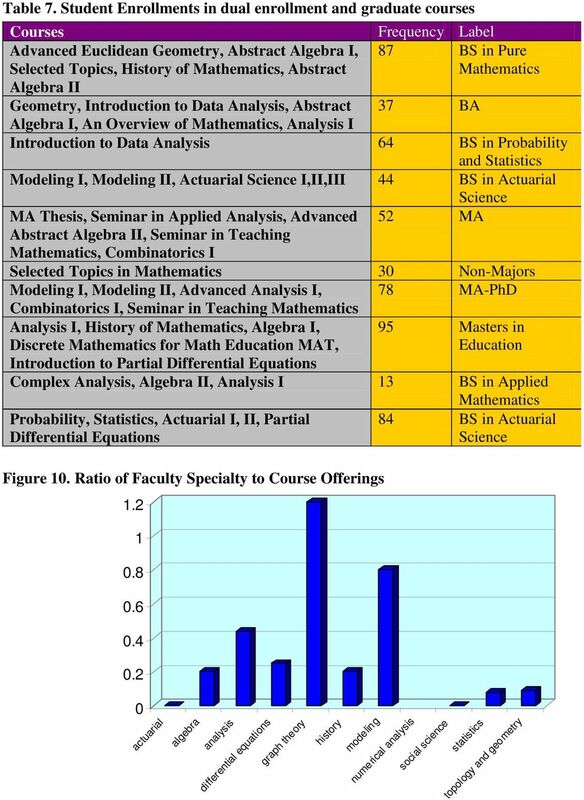 In contrast, Figure 10 shows a ratio of the number of faculty in a particular mathematics discipline to the number of courses taught in the same subjects. The Figure indicates that there are fewer faculty in the most popular student choice of Actuarial Science with only one additional faculty member in probability and statistics. This can be a source of frustration for students who want to take available options that are not regularly offered in the curriculum, another reason for students leaving in the senior year. 16 Recommendations. 1. Require a minimum math ACT for declaration of a major in mathematics. 2. Monitor Departments with dual enrollment courses to ensure that undergraduate students are not penalized in course grades by faculty expectations that they will perform at the level of graduate students. The key is to look at success rates to determine whether there is a dip in grades at the dual-enrollment level and then to compare undergraduate grades to graduate grades. If undergraduates are penalized, develop procedures to ensure that faculty understand the need for different expectations for undergraduates compared to graduate students. 3. Hire faculty to teach more courses in the students areas of interest. Mathematics Graduate Students Students in the MA program must enroll in two out of six possible 2-course sequences; students in the PhD must enroll in four out of six, with two from the group: analysis, algebra, combinatorics and two from the group: modeling, probability and statistics, and applied statistics. In addition, MA students must complete 12 additional hours, not necessarily in mathematics while PhD students must complete 18 additional hours. To complete the MA, students must pass one general written examination, two of the PhD qualifying examinations, or write a thesis; in the PhD, students must complete three qualifying examinations, one internship, one substantive computer project, and a dissertation. Both graduate programs are intended for students who want to be employed in industry rather than academia. Table 8 shows the enrollment for these course sequences. Table 9 shows success in qualifying examinations. Table 8. 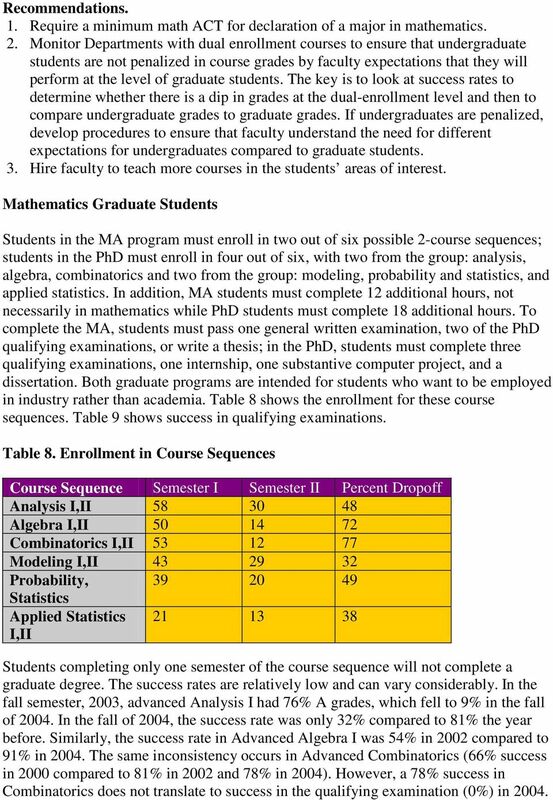 Enrollment in Course Sequences Course Sequence Semester I Semester II Percent Dropoff Analysis I,II Algebra I,II Combinatorics I,II Modeling I,II Probability, Statistics Applied Statistics I,II Students completing only one semester of the course sequence will not complete a graduate degree. The success rates are relatively low and can vary considerably. In the fall semester, 2003, advanced Analysis I had 76% A grades, which fell to 9% in the fall of In the fall of 2004, the success rate was only 32% compared to 81% the year before. Similarly, the success rate in Advanced Algebra I was 54% in 2002 compared to 91% in The same inconsistency occurs in Advanced Combinatorics (66% success in 2000 compared to 81% in 2002 and 78% in 2004). However, a 78% success in Combinatorics does not translate to success in the qualifying examination (0%) in 2004. 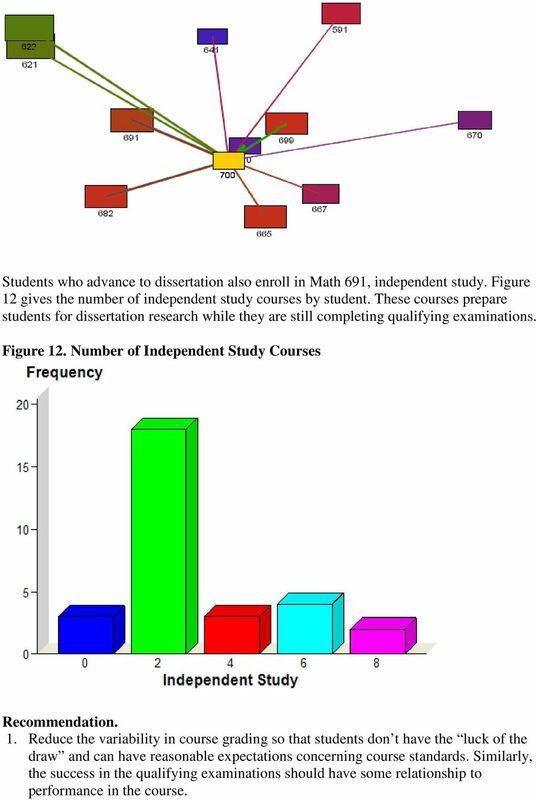 18 Students who advance to dissertation also enroll in Math 691, independent study. 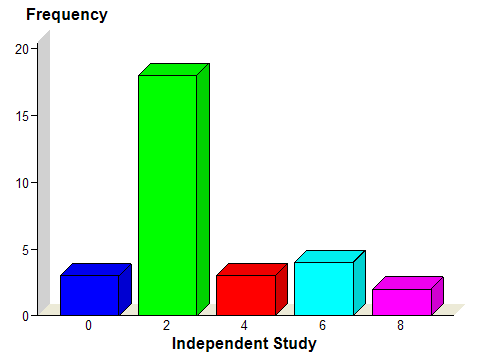 Figure 12 gives the number of independent study courses by student. These courses prepare students for dissertation research while they are still completing qualifying examinations. Figure 12. Number of Independent Study Courses Recommendation. 1. Reduce the variability in course grading so that students don t have the luck of the draw and can have reasonable expectations concerning course standards. Similarly, the success in the qualifying examinations should have some relationship to performance in the course. 19 2. Conduct exit exams with graduate students leaving the University to determine whether the reasons are positive or negative. Discussion In many cases, focus has been on the retention of first year students to the second year. However, this study demonstrates that retention needs to be of concern at all levels of a student s career at the University. Students with high ACT scores and low risk factors are also leaving the University before graduation. At the more advanced course levels, concern has to shift from student preparation to faculty practices, particularly in grading. While it is long recognized that there are hard graders and easy graders, lack of consistency in grading habits can be detrimental to student retention. While consistency is of importance in business and industry, there is no quality control, and no attempt at consistency in grading patterns. Instead, teaching quality is determined almost exclusively based upon student teaching evaluations. These evaluations cannot provide quality control across classrooms because of too many confounding factors. However, faculty autonomy will not generally permit a more general development of examinations in upper division classes. 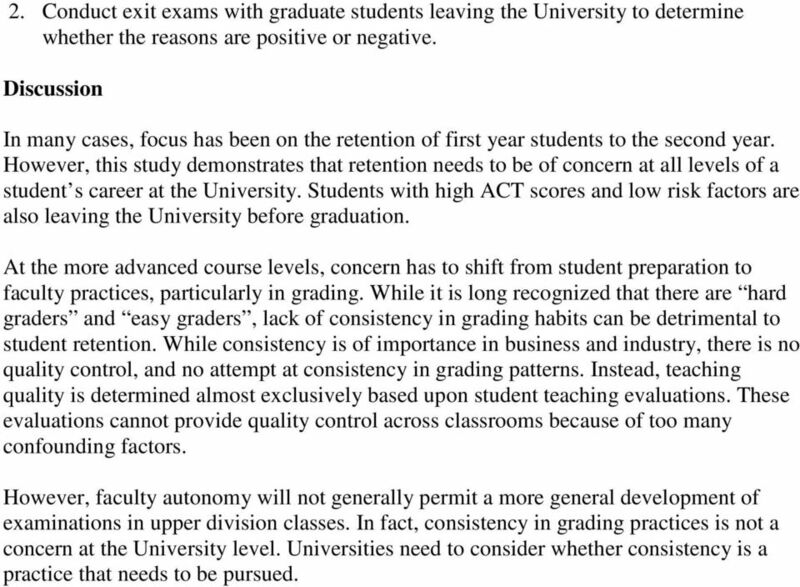 In fact, consistency in grading practices is not a concern at the University level. Universities need to consider whether consistency is a practice that needs to be pursued. So You re Advising a Student to Take Math It is our hope that this document will provide advisors and students with the information they need to be successful in the area of mathematics on our campus. Graduate School. What is it and why is it for you? Lehman College School of Education Advising Worksheet PROGRAM/CERTIFICATION REQUIREMENTS Department of Middle and High School Education.